Throughout the late 1940s and early 1950s, residents and farmers alike continued their struggle to attain and retain precious water. In the growing community of Oak View, wells went dry and citizens began trucking in water. Truckers also hauled water to the Rincon area along the coast, where fresh running water was nonexistent. I n October of 1952, a handful of individuals formed the Ventura River Municipal Water District (VRMWD) with Leland G. Bennett as engineer-manager. In July of 1953, they opened a District office at 480 North Ventura Avenue in Ventura. As their first order of business, they asked the United State Bureau of Reclamation (Bureau) to make a water requirement and supply study of the Ventura River area. With the results of their new investigation and previous studies in hand, the Bureau proposed a 250,000 acre-foot reservoir on Coyote Creek, a 500 cubic-feet-per-second diversion canal from the Ventura River to Lake Casitas and a backbone main conveyance system to distribute water throughout the District through 33-miles of pipeline. Casitas would furnish water for irrigation and for municipal and industrial use within its boundaries. Congressman Charles Teague toured this area to take a look at the water picture for himself. In 1955, he introduced the Ventura River Project authorization bill to the United States House of Representatives. The various bureaus within the Department of the Interior – U.S. Department of Agriculture, U.S. Fish and Wildlife Services, Army Corps of Engineers, U.S. Public Health Services and the State of California – were asked to review the proposal. All of these agencies favored the project except the State. They wanted to implement a smaller plan that would provide a 25-year supply of water at a smaller unit cost. They maintained this was all of the water we would need because Northern California water would eventually be available to us. It made more sense to local project organizers to take responsibility for their own water supply as much as possible. Who Needs a New Dam? Not everyone locally agreed with the plan for a new dam. Some people wanted the dam built elsewhere to preserve the Santa Ana Valley farmland. A group called “The Taxpayers’ Committee” raised questions about tackling a project of this magnitude. They suggested it might be cheaper to desalt ocean water and they hired Stanford Research Institute to study the issue. However, the Stanford report confirmed the future needs for water and methods of developing a water supply project as determined by the Bureau. The Committee then expressed concern about the project payment program. When the Bureau arranged an ascending schedule of annual payments, the Taxpayers’ Committee embraced the project. The Casitas Dam issue was then placed on the ballot. Voters were so enthusiastic about the dam that they approved the project and repayment plan by a 31 to 1 margin. Congress was so supportive that they approved the project in record time without opposition. On March 1, 1956, the Ventura River project was authorized. Soon after, Congress appropriated $6,400,000 to start construction. VRMWD had negotiated a unique contract with the Bureau – one that gave them control of the District and even the water rights. 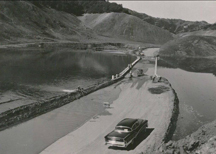 The groundbreaking ceremony for Casitas Dam took place on August 27, 1956. Over the next two years, heavy equipment moved 9,500,000 cubic yards of dirt, sand and gravel – much of it removed from the Santa Ana Valley. Workers dramatically altered the face of the little valley in the process of building the dam. At the Crest, the earth filled Casitas Dam originally measured 40 feet from lakeside to the face of the dam. The foot of the dam was 1750 feet thick. A seismic retrofit in 2000 increased the thickness of the dam by an additional 110 feet. The dam stretches 2060 feet from bank to bank and it stands 285 feet above the lakebed. There are 9 intake gates at different levels in the dam where water is taken, treated and released to the water distribution system to the public. A 750-foot-long access tunnel runs through the dam and leads to the hydraulic system for the gates. The lakebed encompasses 2,760 acres and has a 254,000 acre-foot capacity. 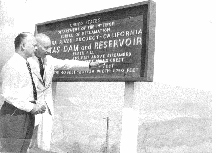 Casitas Reservoir was ready to start accumulating stream flows from Coyote Creek, Santa Ana Creek, and the Robles Diversion Canal by November 1958. A 33-mile network of concrete and steel pipe ranging form 12 to 54 inches in diameter ran from the lake through five different pumping plants and chlorination stations to six balancing reservoirs built to hold a total of 26 million gallons of treated water. Pipelines then continued to reach customers throughout the district and have since added over 95 miles of pipeline. District boundaries encompass Ojai, Upper Ojai, the Ventura River Valley, city of Ventura to Mills Road and the Rincon along the Pacific Ocean to the Santa Barbara County line. Once the Casitas Dam was completed Lake Casitas remained practically empty for four years. Water levels were only a foot and a half above the bottom of the lowest intake gate by 1961. Water was too low to get to customers. Plans were made to bring in barges with large pumps that could get the water into the intake structure. It was February of 1962 when over 20 inches of rain fell within a five day period that Lake Casitas filled to 53,000 acre-feet of water. Then in 1969 there was too much water. Two “one-hundred-year storms” slammed the county. Rainfall reached 70 inches and caused $1.5 million in damages to the Robles Diversion Canal, several pipelines and the Casitas recreation area. The damage prevented Lake Casitas from filling up. It would not be until March 31, 1978 that water would flow over the Casitas Dam spillway. The 1984 Olympic rowing and canoeing events took place at Lake Casitas. Throughout July and August of that year, thousands of straw hat-clad people came with their families to view the historic sporting event.